This scene begs us to ask, “Who was this Cushite woman? And what does Moses’ marriage to her have to do with his siblings’ concern about prophetic authority?” The answer to who this woman was will help us understand what part she played in the struggle between the siblings and therefore will provide us with a better understanding of the point of the story. Generally there are two answers to who the Cushite woman was. The first theory states that she was an African woman and an additional wife of Moses (some say his first wife, some say his second). According to Jackson (p.24), “most” commentators recognize two wives, one Midianite (Zipporah) and one Cushite. Cush was the country immediately to the south of Egypt in what is now modern Sudan. “Both ancient literature and ancient artistic portrayals of the Cushites indicate that they were black.” (Hays, Biblical Perspective, p.9). Historically the term Cushite carried strong connotations of black ethnicity. When Jeremiah referred to the Cushites’ skin he fully expected his listeners to know that he was referring to black people (Jer. 13:23). During the Eighteenth and Nineteenth Dynasties (1550-1200 BC), the period encompassing the events of the Exodus, “the Egyptians carried out numerous military campaigns into these regions and brought back thousands of conquered peoples to Egypt as slaves and laborers. It is highly likely that these people constituted the ‘mixed crowd’ of Exod 12:38” (Hays, Biblical Perspective, p.9). Therefore Moses had the opportunity to develop a relationship with a Cushite woman. The second theory claims that she was actually Zipporah, the named wife of Moses. Goldenberb (p.52) states that it is the “majority view” that Moses’ Cushite wife was Zipporah the Midianite. Those who hold this view make an elaborate argument that Midian was also called the land of Cush and therefore the two terms are identical in this particular instance. Phyllis Trible suggests that the conflict between Aaron, Miriam and Moses was over the legitimacy of the Midianite priestly system. Midianites are thought by scholars to have worshiped a number of gods including Asheroth, the Queen of Heaven. Most sects who venerated this goddess include women as religious functionaries, including high priestesses. Since Zipporah’s father was the chief priest of the Midianites, it is quite possible that his daughter played a significant role in the Midianite cult. Miriam, the prophetess of Yahweh, may have been in competition with Moses’ Cushite wife for religious legitimacy. As you can see, both sides of the discussion claim to hold the majority opinion in the scholarly community. I tried to tally up the numbers myself but found no consensus. So we will have to conduct our own investigation into who the Cushite woman was. Adamo lists eight reasons for not identifying Zipporah with the Cushite wife. I find only two of his arguments cogent: 1) the text does not equate the two; 2) most scholars discredit the notion that Cush is another name for Midian (remember Zipporah was a Midianite) since whenever Cush is mentioned in the Bible the name always refers to a region in Africa. Those who advocate that Cush is an alternative name for Midian base their argument on an obscure usage of the term. I tend to agree with Hays that, “[t]here should be overwhelming evidence before a common, normal usage of a word is rejected in favor of a poorly attested usage. Furthermore throughout the Old Testament Cush is associated closely with Egypt” (The Cushites, p.398). There are other problems with equating the Cushite wife with Zipporah the Midianite. If Moses had been married to Zipporah for 40 years at this point, as indicated in other verses, then why did his brother and sister object to his marriage all of a sudden (Hays, The Cushites, p. 398)? Therefore I conclude that Moses married a black African woman who was not Zipporah. Now let’s concentrate on the conflict between Miriam/Aaron and Moses. The ancient rabbis proposed that Moses had been so busy administering to the needs of the Israelites that he neglected his wife by not providing her with intimacy and children. Miriam and Aaron challenged Moses to obey the commandment to “be fruitful and multiply” and therefore pay more attention to his wife. Miriam and Aaron argued that they were as capable of leading the people as Moses and they would hold down the fort while he had sexual relations with his wife. Miriam and Aaron were only intervening in their brother’s marriage for the sake of his wife (see for example Fewell & Gunn, p.114). As positive sounding as this explanation is, it doesn’t quite add up for me. If they had such good intentions then why did God then strike Miriam with leprosy? In addition, the text portrays Miriam and Aaron being quite disturbed by Moses’ choice of a wife: “He married a Cushite woman!” What does the wife’s ethnicity have to do with Miriam and Aaron’s authority? How does the black woman’s presence challenge the power structure between the siblings? Another line of argument states that Moses had an inflated sense of himself and his siblings challenged his hubris. “[Miriam] claims that Moses’ marriage to the Cushite woman may increase his social status before Yahweh… Miriam’s reference to the Cushite wife is not a racist claim against this woman; rather it is a disclaimer that association with the Cushites is not the prime way to gain status.” (Bailey, p. 179) The ancient Jewish writer Josephus relates that the Cushite was Moses’ first wife and her name was Tharbis. (Antiquities XI:1). 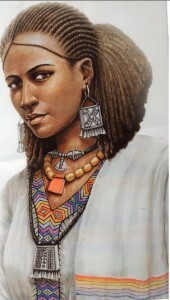 Later Jewish legends described her as a Cushite princess named Adoniah (Shinan, p.68). The legend is a fascinating description of a successful African military campaign led by Moses. For his victory he was awarded the Cushite princess as his wife. Regardless of the details of the legend, it is possible that Moses did marry a Cushite of high standing whose position as his wife increased his status. This is an intriguing possibility. However, the idea finds little support in the “original” text. Were Miriam/Aaron offended by Moses’ marriage to a black woman and they objected to the interracial marriage? Is this a racially motivated conflict? Perhaps the answer lies in God’s response. According to the narrative, after the angry Yahweh departed angrily, “Miriam had become leprous, as white as snow” (NRSV v. 10). “Although the text lacks explicit color terms (i.e., laban – ‘white’), the phrase ‘leprous, as snow’ cannot be void of all color content. Athalya Brenner, in her monograph on color terms in the Old Testament, classified the root of the term ‘snow,’ seleg, as a secondary color term that functions “as specifications of ‘laban or ‘whiteness.’ In this manner, ‘leprous as snow’ can be understood as a simile for ‘whiteness’ in Num 12:10, as is apparent in the NRSV translation” (Sadler, p.397). Miriam (and supposedly Aaron) criticized Moses for marrying a black woman and as punishment Miriam is made into the exact opposite, “white as snow” (Bailey, p.180). Though this explanation connects the cause (criticism) with the effect (leprosy) in a logical manner, it doesn’t really explain how the sibling’s prejudice against the black wife relates to their sense of powerlessness. Perhaps Miriam and Aaron believed that God had spoken through them and had prohibited intermarriage. Certainly the Bible exhibits great tension between the advocates of foreign marriage (see for example the Book of Ruth) and those who reject exogamy (such as the prophet Amos). However, the objection to foreign women is never about their race but about their religious commitments. It is important to note that Yahweh and later biblical writers approved of the interracial marriage. “Moses’ union with a Cushite woman in no way diminished his standing in subsequent generations. Later interpreters did not employ the fact of his marriage to a Cushite woman to denigrate their lawgiver” (Sadler, p.397). It seems that God’s stern rebuke of Miriam and Aaron was a firm affirmation that bigotry was not tolerable, “a perennial reminder of the extraordinarily progressive racial values of the Bible in comparison to the hostile racial attitudes in the medieval and modern period” (Felder, p.42). Given that racial controversies continue to haunt us, as difficult as this narrative is, it remains theologically essential. Adamo, David Tuesday – “The African Wife of Moses: An Examination of Numbers 12:1-9” African Theology Journal 18 (1989) 230-37. Hayes, J.H. – “The Cushites: A Black Nation in the Bible” Bibliotheca Sacra 153 (Oct. – Dec. 1996) 396-409. Hayes, J.H. – “A Biblical Perspective on Interacial Marriage” Concordia Theoligical Review 6/2 (Spring 2009) 5-23. Sadler, Jr., Rodney S. – “Can a Cushite Change His Skin? Cushites, ‘racial othering’ and the Hebrew Bible” Interpretation, 60/4 (2006) 387 – 403. Shinan, Avigdor – “Moses and the Ethiopian Woman Sources of a Story in the Chronicle of Moses,” Scripta Hierosolymitana 27 (1978) 67-72.